Ever since I remember my growing age, Maggi had been the indispensable delicious delight in my mind, in my mouth and in my stomach 😛 It has that inseparable relationship, especially among kids, hostlers and late night movie watches, without which the existence of other remain food-less. Though I exaggerated a bit, but yeah it is one food for thought that lowers down the craving of yummy mouth-watering delight even at breakfast, after lunch snack or late night’s study, or gossip. In a nutshell, it’s really very disheartened to hear the ban of my or let’s say decades old favorite noodle of every Indian. 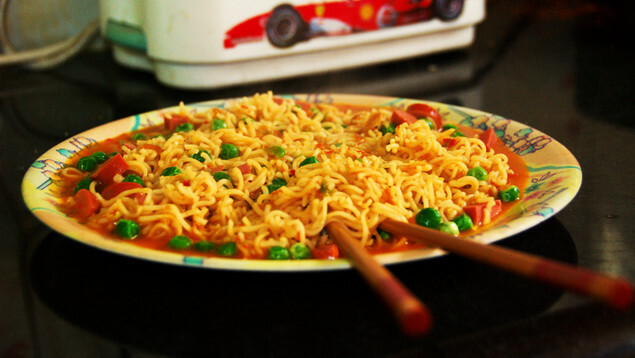 In fact, till the age of 12, I related “use your noodle” idiom literally with Maggi noodle. To make your Maggi, you need not to be a master chef. It is that 2 minute piece of cake that qualifies every aspiring bride or groom in Indian Marriage University. To my knowledge, it is the only food, other than water, that transcends every language and culture and became a household name from valleys of Kashmir to the backwaters of Kerala. Being now considered as a forbidden fruit by FSSAI (Food Safety Standards Authority of India), the small child in me still crave for those yellowish-masala-dipped-Maggie. I wish- lead find another home to stay in other than Maggi, so that I can continue its taste for many years to come. Previous Previous post: De-Code the Secrets of Party Queen!! Next Next post: Murder Mystery – WhoDunIt?? ?